AirportWatch | Recent cases of icefalls – and now a pair of pliers – from planes onto homes. Nobody injured, so far. Recent cases of icefalls – and now a pair of pliers – from planes onto homes. Nobody injured, so far. There have been a considerable number of cases of items falling from aircraft, onto houses under flight paths. The most recent is a case of a large pair of pliers that appear to have been left in the undercarriage of an easyJet plane (as reported by the Sun newspaper) which fell onto a house in Canvey Island, on its way to land at Southend. Falling from some 7,000 feet the pliers went straight through the tiled roof and the ceiling. Luckily the occupants were not hurt. In March a block of what appears to be frozen aircraft lavatory waste fell onto a static caravan in the Midlands, causing severe damage to the roof of the caravan’s bathroom and its floor, as well as ruining the rest of the bathroom. 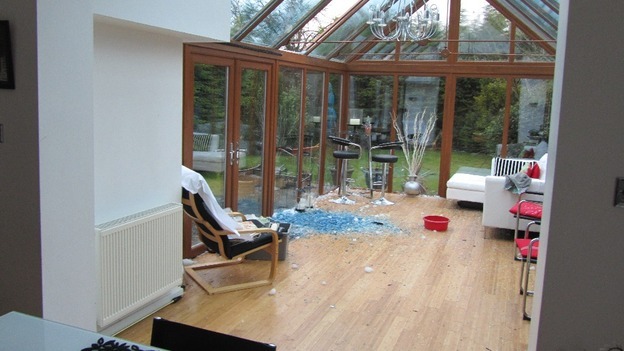 In February a block of ice did serious damage to the conservatory of a house in Clanfield, Hampshire, shattering glass. Again, fortunately, nobody was in the room when the block fell, as they would possibly have been badly injured by flying glass. A MUM froze in terror as a wrench tore through her roof and smashed into her lounge — after falling 7,000ft from a plane. Skyfall … the wrench smashed through tiles. It had been left in the undercarriage of an EasyJet plane coming into Southend Airport in Essex. Traumatised Shirley Watts, 48, feared the tool could have killed her and son Leo, eight. She said: “I was in my bedroom when there was the most almighty noise. includes a video clip showing the damage, when the block of yellowish ice crashed through the roof of a static caravan, and crashed through its floor, doing profound damage to the whole bathroom on its way. …. a pile of frozen poop from an airplane crashes through your roof and wreaks your home. Last Saturday at 7 a.m. Caroline Guy thought she was being burglarized when she heard a loud crash. Imagine her surprise when she saw chunks of brown and yellow ice scattered throughout her caravan (trailer) and an 18-inch hole in her roof and floor. To preserve the evidence she stored the airplane waste in her freezer… wrapped up in a plastic bag, of course. This sort of accident happens if there is a leak in the plane’s lavatory system that thaws, and the ice (waste from the lavatory) breaks off from the outside of the plane when it makes its descent. A block of ice the size of a bowling ball crashed through the roof of a conservatory in Clanfield, Hampshire after falling from a passing aeroplane. 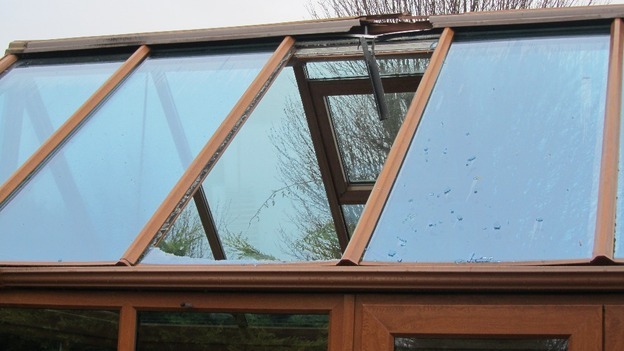 A block of ice, believed to have fallen from a passing airplane, has ripped through the roof of a conservatory in Clanfield, Hampshire. The home owner, Jeff Scriven, said the ice was “the size of a bowling ball”. 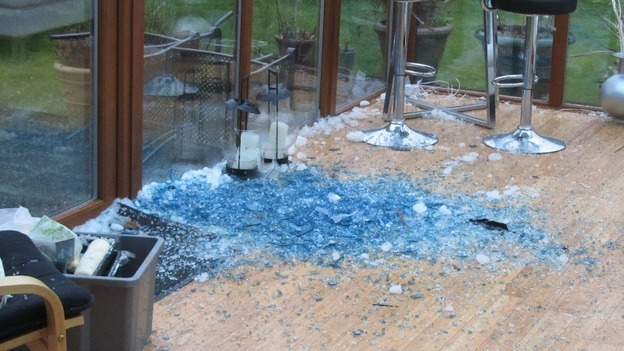 He was working from home when he heard an “almighty bang” and found that the ice had shattered all over his conservatory floor. He told reporters: “It’s just lucky no one was in there at the time. 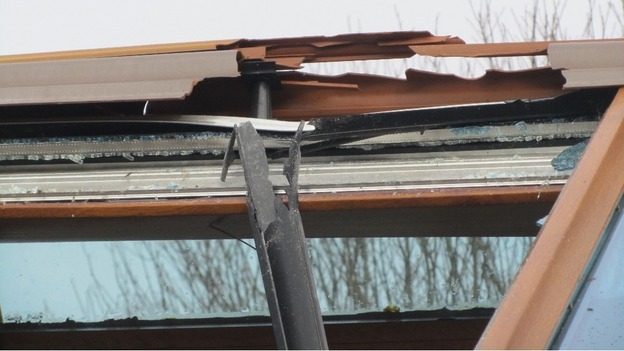 There was glass everywhere, it had shattered a 6ft by 2.5ft double glazed panel in the roof. “It’s clearly an ice ball. It was the size of a bowling ball and I believe it came from a plane. He said the Civil Aviation Authority, sent him a letter confirming that the incident had been logged. They also explained that it’s unlikely that the responsible airline will ever be identified. Experts believe that these chunks of ice fall from planes as they fly overhead – made up of frozen rainwater or toilet waste. Posted: Saturday, April 27th, 2013. Filed in General News, Recent News.